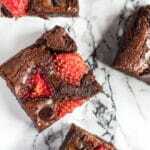 Strawberry Mint Brownies – Deliciously thick and fudgy chocolate brownies that are infused with refreshing mint, and stuffed full of fresh strawberries! Looking for a quick and simple recipe that also looks beautifully impressive for Valentine’s Day? 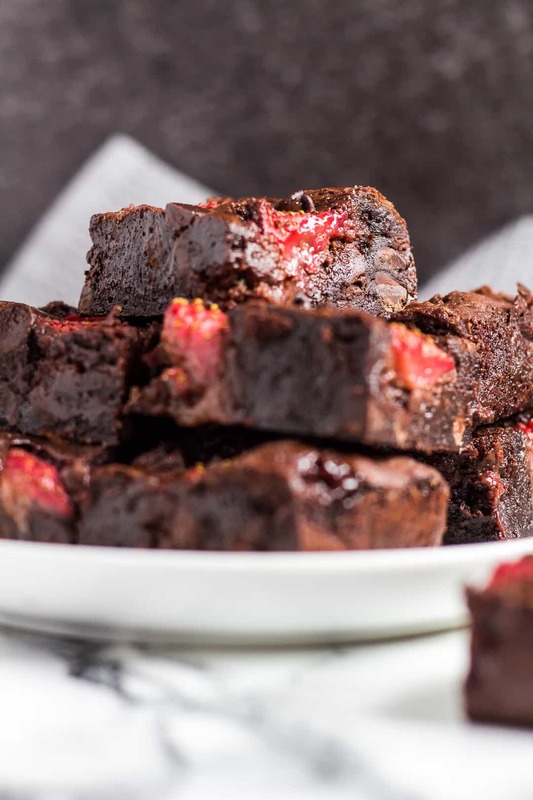 Look no further than these Strawberry Mint Brownies. 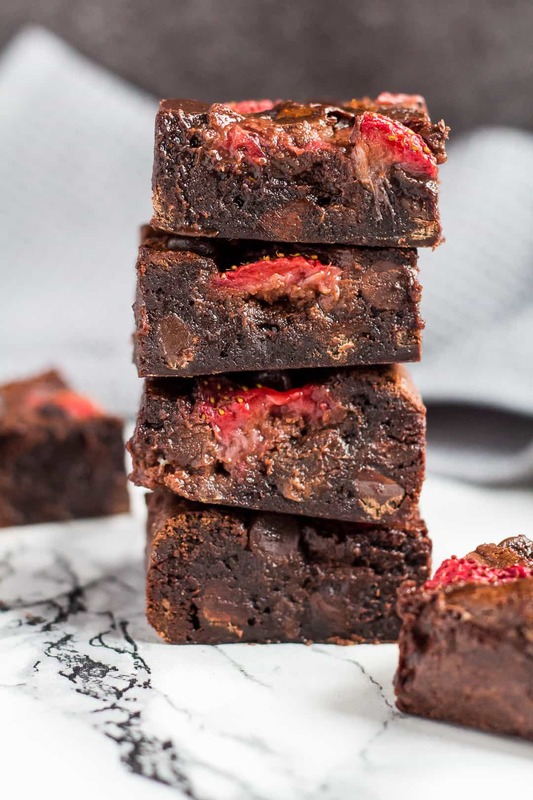 These brownies are prepared and baked in under an hour, and the pop of colour from the strawberries make them extra pretty. The perfect chocolate treat to serve up to your loved one! 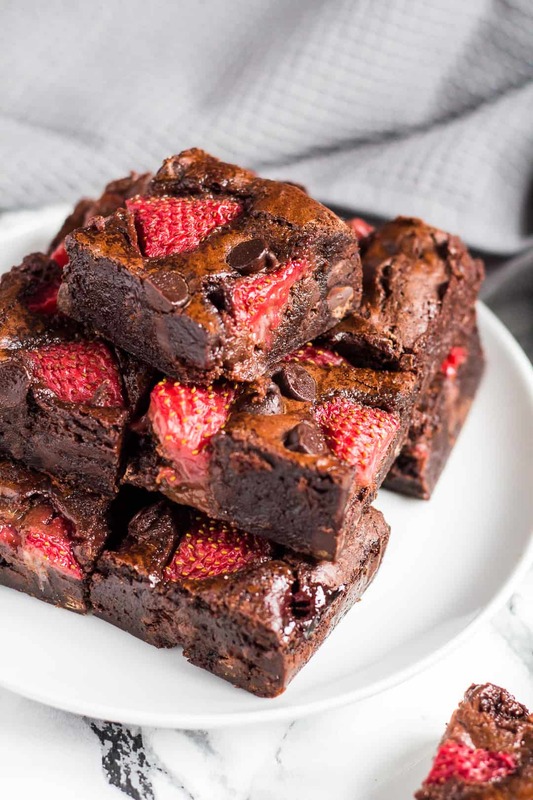 To make these strawberry brownies, simply add the butter, sugar, cocoa powder, and salt to a microwave-safe bowl, and heat in 30 second intervals, stirring after each one, until the butter is melted and the mixture feels very warm/hot to the touch. Mix in the eggs, then stir in the peppermint extract. Fold in the flour until fully combined, then fold in the chocolate chips. Gently fold in the chopped strawberries. Pour the batter into an 8×8-inch square baking pan lined with foil or parchment paper, and spread out evenly. Top with a few extra strawberry halves if desired, then bake for 35 – 40 minutes, or until no longer jiggly in the centre, and a toothpick inserted comes out almost clean with a few moist crumbs. incredibly thick, and so fudgy! pretty and so delicious – perfect for Valentine’s Day! I absolutely love thick and fudgy brownies that are full of delicious flavours, and these brownies are just that. 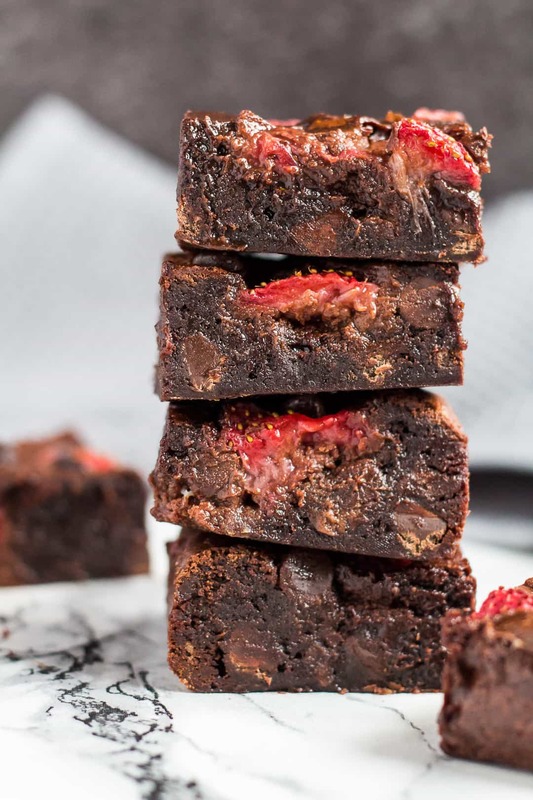 If you love thick, rich, fudgy brownies, and juicy fresh strawberries, then you are gonna love these. Paired with the minty flavour, these brownies are amazing! More delicious brownie recipes to try! 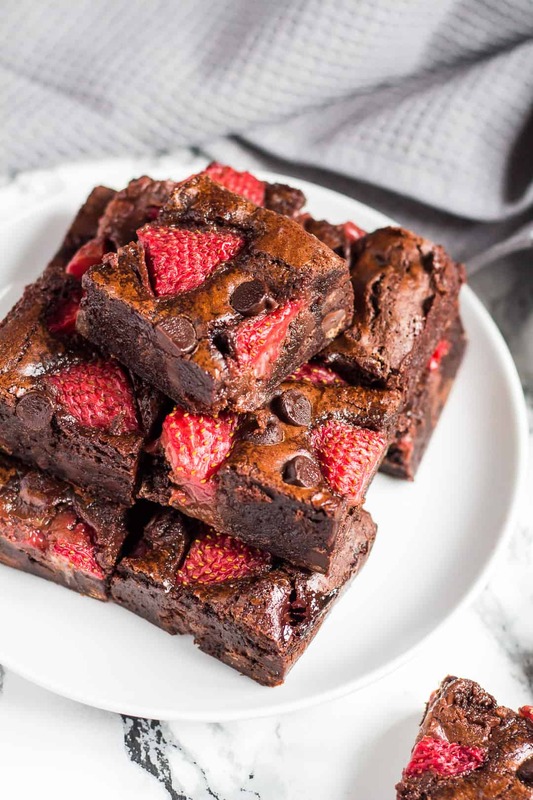 Deliciously thick and fudgy chocolate brownies that are infused with refreshing mint, and stuffed full of fresh strawberries! Mix in the eggs, one at a time. Stir in the mint extract. Fold in the flour until fully combined, then fold in the chocolate chips. Gently fold in the strawberries. Pour the batter into the prepared pan, and spread out evenly. Top with a few extra strawberry halves if desired, then bake for 35 - 40 minutes, or until a toothpick inserted into the centre comes out almost clean with a few moist crumbs. Allow to cool completely in the pan on a wire rack before cutting into squares. I have a weakness for mint brownies! I bet they’re especially delicious with the addition of strawberries. Yum. 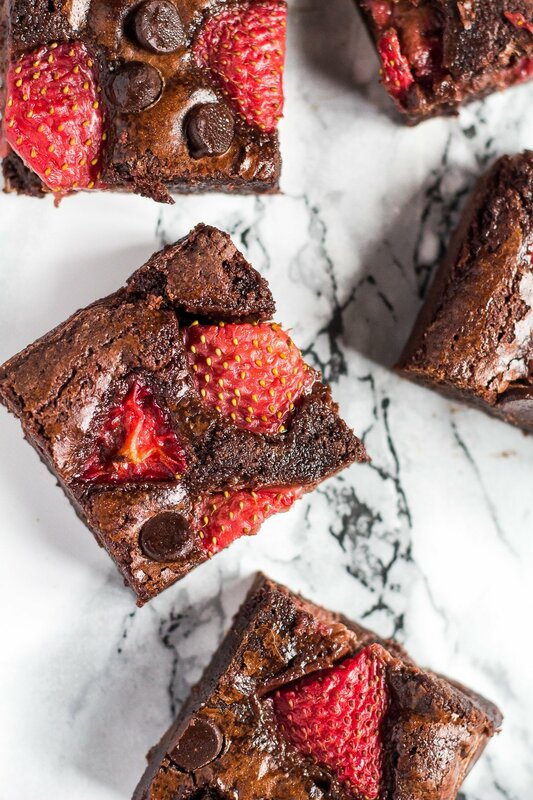 I’ve never thought of putting strawberries in brownies before, but they look gorgeous. Happy Valentines Day! I just made some this morning. They are amazing!